Paros is among the most popular islands in the Cyclades and was voted No.1 Island in Europe 2018. Located in the heart of the Aegean Sea amongst the famous islands of Mykonos, Santorini, Antiparos and many more. 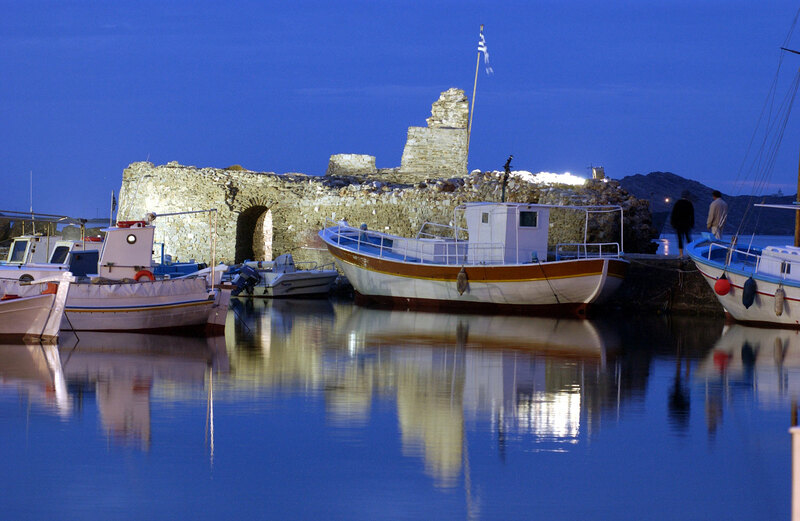 Paros is home to 15.000 permanent residents. The warmth and hospitality of the Parian people wonderfully complement the islands’ diversity making it ideal for travelers of all ages. Paros offers a wide range of activities whether you are seeking a bather’s paradise, culture, history, discovery, land, water and underwater adventures, or a vibrant nightlife. Enjoy authentic Greek cuisine with locally sourced fresh vegetables, delicious fresh fish and seafood. Introduce your palette to delicate and succulent wines from the local Moriatis winery and enjoy renowned Greek ouzo as you immerse yourself in the mesmerizing beauty of crystalline waters by the sea. You will be welcomed by the charming hospitality of the locals who are ready to assist you with your every need to ensure that you have a most enjoyable stay. Although Paros welcomes thousands of visitors every year, the large size of the island prevents overcrowding. Whether you are looking for a quiet relaxing paradise or a high-energy adventurous discovery, the enchanting Island of Paros remains an affordable and safe destination which offers it all. Being a unique island of Aegean Sea and having 120km of coastline, there are numerous breathtaking bays with crystal clear waters and exquisite sandy beaches. The numerous narrow paved alleys with picturesque whitewashed houses, the hundreds of chapels, the windmills and the pigeon towers complete the Aegean architecture always in harmony with modern life. Besides, the offered facilities of a contemporary holiday resort (such as airport, port, marinas, fishing retreats, civil services, post offices, a public medical center, a private clinic in the capital and a full range of shops) certify that you will not miss anything from your daily life. Paros offers perfect conditions for water sports. Paros diving holidays are particularly special, and there are many diving centers to choose from, catering for every level of scuba diver from the complete beginner to the seasoned expert. Scuba diving in Paros is particularly popular due to the wonderfully warm water temperatures, superb visibility and huge array of marine species. In Paros there are many great spots for windsurfing and kite surfing, with both equipment hire and lessons readily available. Paros is a true paradise destination. Discover the traditional white villages with picturesque houses along the marble and cobbled stone roads and pathways meticulously outlined with white-wash. Discover Cycladic architecture and neoclassical buildings. Engulf yourself in the crystal waters of the Aegean Sea. Discover the mesmerizing beauty of both isolated and cosmopolitan beaches. Introduce your palette and enjoy our home-style cooking at the numerous authentic Greek family owned taverns. Prepare yourself for intense fun as the party lasts until dawn. Allow yourself to be swept away by the colors and the pure magic of the Parian sunsets and sunrises. Awake to the deep blue of the sky. Gaze into a sea of colorful fishing boats which bid us “Good Morning” as they come to shore brimming with the “treasures” of the day, as the seagulls fly around them dancing in playful delight. Paros offers various kinds of entertainment for all age groups and any kind of holidays you wish to do. It is one of the few islands which can combine quiet and relaxing family holidays as well as diverse day-time activities and intense night life entertainment. It is in short, an island for all ages. 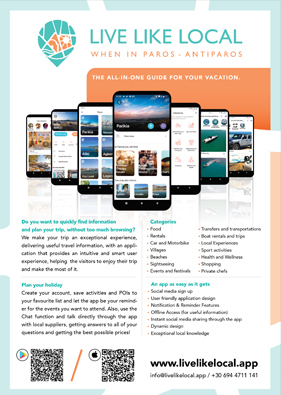 You may visit the numerous beach bars, cafés, night clubs, restaurants, water parks and attend various local feasts and artistic events such as exhibitions, dance performances, concerts, plays and literary readings. Artists and Art Appreciators have plenty of opportunities to attend exhibitions in galleries throughout the island and also cultural events. All year round there are art seminars and lessons offered as well. Visit the famous cave with Stalagmite and Stalactite which is located at the small island of Antiparos. Antiparos is opposite of Paros and you could reach the small island by boat in ten minutes. Despotiko Island is a small uninhabited island opposite of Antiparos. In the year 2000, archaeologists discovered the remains of a 2.500 year old Apollo temple on Despotiko. Part of it has been excavated but there is thought to be lots more just below the surface. - To see the sunset from the hill at Agia Anna & the church of Agios Konstantinos in Parikia. 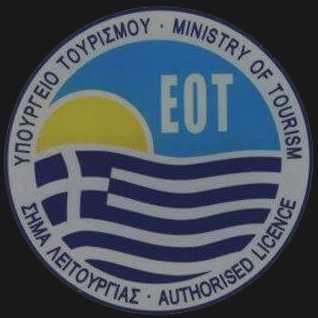 - To organize a daily trip around Paros and ask to visit “Blue Lagoon” for swimming. - The sunrise from Agios Nicolas in Piso Livadi. - A stroll in Naoussa, in the picturesque little port with its colorful rowboats and sailboats, the sounds of the 'Tratas' (fishing boats), of the children laughing and running and the smell of grilled Gouna and Octopus. Lose yourself in the narrow alleys and the paved walkways while being greeted by the locals who still sit in front their houses on stone benches in the evenings, talking about the day that passed. - A stroll in Parikia, on Gravari Street, where one meets neoclassic mansions and manors of the Venetian times, with giant marble arches, columns, arcades, churches and the water fountains of Lord Mavrogenis. Continue your stroll towards the central market place and reach the castle, thus discovering the old traditional village. - A stroll in Lefkes, a walk from the entrance of the village towards the church of the Holy Trinity (Agia Triada), the proud jewel of the village, brings you across a lot of neoclassic mansions harmonized with the Cycladic architecture. At the historic coffeehouse, you may get a taste of the uniqueness of the village: the tidiness of the locals, their respect for the artistic Cycladic character and their neat balconies and terraces filled with blooming basil plants, bougainvilleas and carnations. 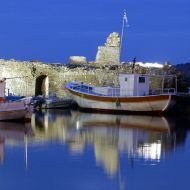 - A stroll inside Marpissa, Marmara and Prodromos and let yourselves go with the magic images spreading before your eyes. - A stroll in Piso Livadi with its tranquil small port and then to Logara with traditional restaurants on the beach and a beautiful sandy beach with clean waters. - A walk in Drios with its lake and its running waters, down to the port where one finds some very old 'neosikous' (shipping docks) made in the Venetian times for the boats to anchor and get prepared for pirate attacks. - To walk one night under the full moon next to the sea. - To dance a round of Balos and listen to the sounds of the 'Tsambouna' (traditional bag pipe) along with the locals at one of the festivals, and of course taste some of the delicious fish dishes and Parian wine. - During the summer months daily excursions to neighboring islands are organized. - Take the small boat and visit Antiparos. Walking to the stone paved streets of the traditional village of Antiparos, you will feel the real atmosphere of the lovely island. Visit the famous cave with Stalagmite and Stalactite, the beautiful beaches and organize a tour to Despotiko Island with many ancient treasures. In the year 2000, archaeologists discovered the remains of a 2.500 year old Apollo temple on Despotiko. Part of it has been excavated but there is thought to be lots more just below the surface.